The legal tangle for professionals trained in the art of African hair braiding is nearing its end. A federal court has ruled that Texas laws restricting braiders’ ability to open hair braiding schools are unconstitutional. State lawmakers are now considering legislation to drop restrictions on the hair braiding industry altogether. The Texas Department of Licensing and Regulation will likely be getting out of the hair of the state’s professional braiders. “Tax Cuts” is the phrase that pays this session.The Senate has already approved its tax relief package totaling $4.5 billion in cuts to property and business franchise taxes. Today, Rep. Dennis Bonnen (R-Angleton), Chairman of the House Ways and Means Committee (committee of jurisdiction for tax issues), released the House’s tax relief package. The House proposal totals $4.9 billion in tax-relief, cutting the sales tax rate to 5.95% from the current 6.25%. Bonnen’s plan also includes a 25% cut in the state business tax rate. Chair of the House Public Education Committee, Jimmie Don Aycock (R-Killeen), rolled out his school finance proposal to address funding concerns raised in the pending school finance lawsuit. The House Public Education Committee will take testimony on Aycock’s proposal next week. As US Senator Ted Cruz enters the 2016 presidential race, he won’t be running alone. Four Austin-based super PACs will back Cruz as he campaigns for the Republican nomination. They expect to raise a whopping $31 million during their first week. Although super PACs have radically changed the pace of political fundraising, the Cruz haul is remarkable. There are no known cases in which an operation backing a White House hopeful has collected this much money in less than a week. Cruz is no longer alone in the 2016 presidential race. Rand Paul, a U.S. Senator out of Kentucky with Texas roots, has formally announced a bid for the Republican nomination. Cruz’s fundraising blitz may give him an edge in what is sure to be a packed race. Hidden deep within the Capitol, the Legislative Research Library (LRL) is a sanctuary from the typical hustle and bustle under the rotunda. The LRL was established in 1969 and charged with the task of satisfying the reference and research needs of the Legislature, its staff, its committees. Whenever possible within this framework, the library also assists the public and other state agencies with legislative research. 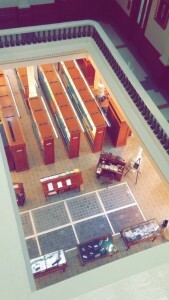 Today, the library’s collection has grown to approximately 49,400 titles and 134,772 volumes.